Never Enough Nails: Zoya Urban Grunge Cremes Fall/Winter 2016 Swatches! Zoya Urban Grunge Cremes Fall/Winter 2016 Swatches! Are you ready to drool today? I hope so, because if you love cozy fall colored creme, you are going to love the Zoya Urban Grunge cremes! 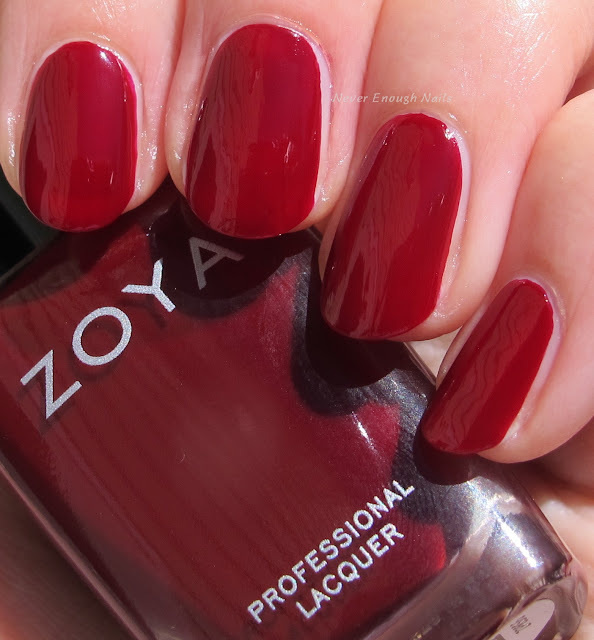 Zoya Courtney is an oxblood red creme. It's a little lighter than some of the oxblood colors we saw last fall. Zoya describes it as "beet root" red, but I always think of beets as much more purple. This has a hint of purple, but it is mostly a strong deep red. This is two coats. Courtney is a little on the jellyfish side, so I sill had a lot of VNL after one coat. You can see I did a thinner second coat on my index finger and still have some VNL there. For the rest of the nails, I used a slightly thicker layer for the second coat. The formula was great though, super nice to apply. Get used to that because I'll be saying it for this whole post! Zoya Wyatt is a hunter green creme with a nice moody fall edge. It has some blue tones to it, almost like a deep wintergreen. Green is usually a fresh color, but this manages to feel a little dusty and grunge-y. If you're a green lover, you should definitely grab Wyatt! This is two buttery, flawless coats. It could definitely be a one-coater, depending on your application. I actually prefer to do two thinner coats, so I very rarely find one-coaters that I like at only one coat. But it is beautifully pigmented and the perfect consistency. 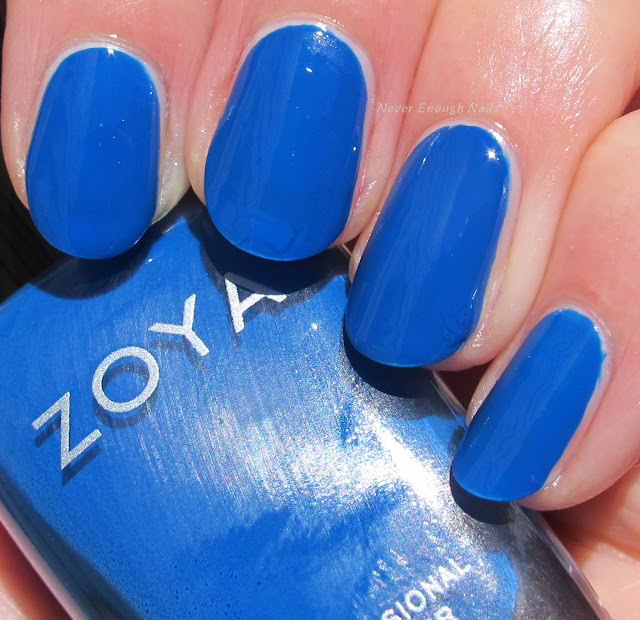 Zoya Mallory is a bright cobalt blue creme. This is the one polish in the collection that doesn't feel like fall as much as the others, but I love a good cobalt blue, so I'm not complaining! I sometimes need a kick of vibrant blue in the winter, and I'll be reaching for this one when I do. This is one coat of Mallory. It is very pigmented and coves well in one coat. I probably should have done a second coat for the camera, but it looked completely opaque to my eyes. The formula was a little thinner than the others, though still easy to apply. I would also double up on base coat. I had some staining on my skin, so this could be a possible stainer (I haven't worn it yet for a mani though, so I could be wrong!). This plum creme might be my new favorite purple. 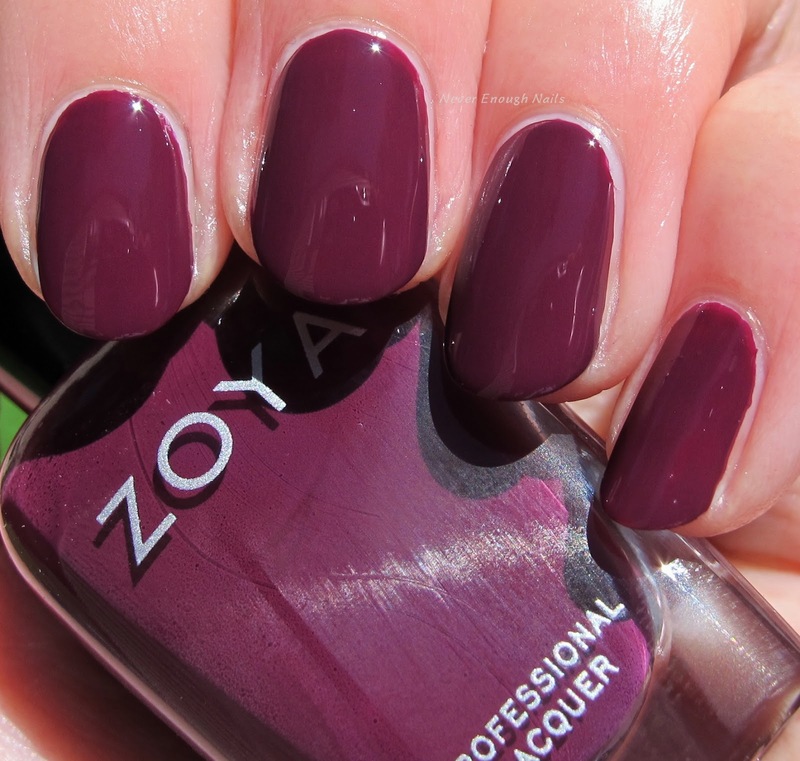 Zoya Tara is just delicious looking, it's a perfectly balance plum, just enough red and purple mixed together. It's dark enough that it looks perfect for fall, but not so dark that it looks muddy or black. This is the perfectly plummy creme I've been looking for! This is two coats of Tara and the formula was awesome. Nice and pigmented, great consistency and smooth application. I don't usually think of taupes as interesting shades, but Zoya Noah is a pretty interesting taupe. It's a little bit of a yellow-beige, but it has some gray tones to it to grunge it up. It is pretty complex looking in person, you have a hard time figuring out what color to really call it. It's a neutral, but it has some edge so it won't be boring. I like it a lot and will be wearing it the next time my life calls for a neutral. This is one coat, even for me! It is very pigmented and doesn't need a second coat, even with my tendency towards thin coats. It is a little on the thicker side, but very easy to apply and the thickness helps it cover evenly in just one coat. Zoya August is a gray creme that reminds me of seagulls at the beach. Maybe that just came to my mind because I've been spending so much time at the beach recently, but seagulls really do have beautiful gray colors in their feathers! Zoya calls this a "full coverage gray like a fine, expensive leather with a mid-ranged, balanced tone". It is nicely balanced, not too blue-toned, so it will be great for a wide variety of skin tones. This is one coat. It is perfectly opaque in one coat, like Noah, but I feel it shows any imperfections in my nails. When I actually wear this, I'll probably do two coats. The formula was really good though, very easy to apply. Zoya really knocked the formulas out of the park in this collection. They are all super pigmented and have a great consistency that makes them easy to apply. Overall, I think these cremes are all really beautiful for fall and you can't go wrong with the formulas. Zoya is calling them "one coat" cremes, and honestly, they are probably correct. I just personally prefer applying two thinner coats, so you may be able to do one coat of almost all of these. I would say Courtney is the only one that needed two coats. My favorites are Wyatt (no surprise there, it's green!) and Tara, but I really like the whole group of them quite a lot! The Zoya Urban Grunge cremes are available now at zoya.com.